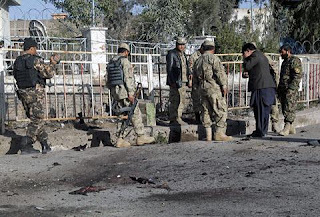 A suicide bomber has killed at least two Afghan civilians and wounded four others after detonating explosives at the gates of the U.S. military base at Bagram, just north of Kabul. The Taliban claimed responsibility for the bombing, saying it was revenge for the burning of Qurans several weeks ago at the Bagram Air Base. NATO officials said no coalition troops were harmed in the attack and that the bomber did not breach the base.